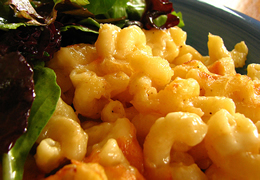 This easily prepared macaroni and cheese dish will not disappoint. Layer the ingredients for wonderful flavor throughout. Serves 6-8! In a bowl, mix eggs, evaporated milk, sour cream, salt, and pepper. Layer pasta, milk mixture, and both cheeses in a baking dish (2-3 layers). Leave some Parmesan to sprinkle on top. Bake for 20-30 minutes or until milk mixture doesn’t run.